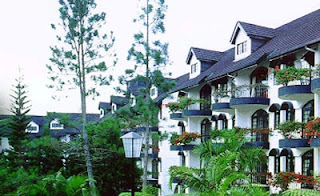 Strawberry Park Resort Cameron Highlands is a touch of mountain rustic and dash of city sophistication. Between these extremes, it is the Highlands' most charming, truly beautiful set of vacation rooms/apartments, giving delight to its occupants. It is certainly one of prettiest Resort in Malaysia and in this Asean Region. The neo Tudor design of the resort blends perfectly with its breath taking natural surrounding while offering the comforts of modern facilities.